If you have graduated or will graduate after 2012 you may have to repay up to £300 extra per year on your student loan. The proposal, announced in Osbourne's summer budget, will see the loan repayment threshold "frozen for five years" at £21,000, meaning that graduates will be required to repay more each year towards their student loan. As inflation rises £21,000 will be worth less, but graduates will still be required to begin repaying their student loan the moment they hit this threshold. The government’s own review suggests students on average - moderately high wages will repay thousands more under the new proposals, whilst higher earners will pay back less in the long term. The current system for graduates is that you begin repayments for your student loans once you earn over £21,000 per year, which you then repay over 30 years. Any debt after that point that remains unpaid is written off (if for example you didn't earn enough to pay off your full debt). You pay at the rate that you can afford, with higher earners paying off their debt more quickly than lower earners. 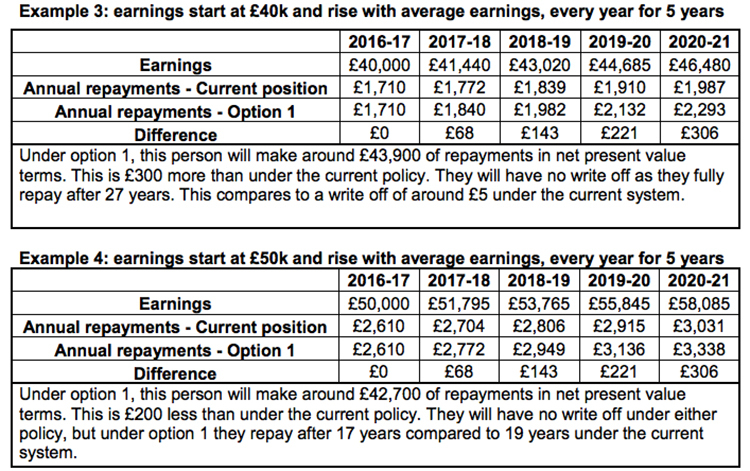 For example, someone earning £22,000 will repay £90 a year, whilst a graduate on £30,000 will repay £810 per year. Under the new proposals you will start your payments whilst you are effectively earning less than before, as in five years time £21,000 will be worth less than it is in today's money. (Think about how your grandparents always claim they bought their 14 room mansion for a pound). This means that lower earners will begin paying more towards their student loans earlier, and pay more over time (working out to around £300 per year). Graph taken from government's own proposals. Because of the interest rate charged on student loans, people who earn average-good wages will repay the most over the 30 years - if you earned over £80,000 (for example) you would repay your loan at a quicker rate and so you'd pay less interest, whereas someone earning £35,000 would repay their whole loan but over a longer period of time, meaning they have to pay more interest. Whilst everyone earning above £21,000 will pay more each year under the changes, graduates on moderate incomes are hit harder than high earners. This plan will affect 2.1 million people by 2020. “This is yet another betrayal by the government and part of a long list of political measures that will disadvantage students,” NUS vice president Sorana Vieru told BuzzFeed News. “Freezing the repayment threshold won’t just affect new students but those who started studying in 2012, and will have a real impact on the income of graduates, particularly the most disadvantaged. You can read the full proposals set out by the government here and respond to the consultation proposals here until 11:45pm on Wed 14 October.